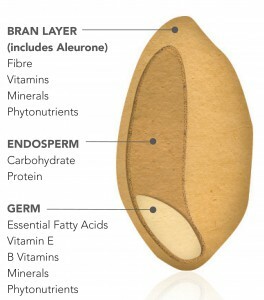 Bran – the multi-layered outer skin of the grain which is rich in vitamins, minerals, phytonutrients and fibre. Endosperm – the food supply for the germ, which is dense in starchy carbohydrates and protein. Germ – the embryo, which contains the genetic material for a new plant, is abundant in essential fatty acids, vitamin E, B-group vitamins, minerals and phytonutrients. The term ‘whole grain’ is used to describe an intact grain, flour or a food that contains all three parts of the grain. Together they deliver over 26 nutrients and other active substances which nourish the body and help to reduce risk of disease. Processing grains does not necessarily produce ‘refined grains’ or exclude them from the Australian definition of a ‘whole grain’. Nutrients dense; delivering vitamins, minerals, trace elements, proteins and carbohydrate for energy. Rich in a range of dietary fibres. A source of protective phytonutrients. Naturally low in saturated fat and salt. In addition, enjoying a variety of whole grain foods can help to lower the overall glycemic index (GI) of your diet. Examples of foods made with whole grain or wholemeal ingredients include wholemeal and mixed grain breads, rolls, wraps, flat breads and English muffins, whole grain breakfast cereals, wheat or oat flake breakfast biscuits, whole grain crispbreads, rolled oats, wholemeal pasta, brown rice, popcorn, bulgar (cracked wheat) and rice cakes. With an impressive nutrition profile it is no wonder whole grains and whole grain foods are recommended as part of healthy diets around the world. The Australian Dietary Guidelines recommend we eat a variety of grain foods each day choosing mostly whole grain and/or high fibre varieties. Intact, cracked or kibbled (chopped) whole grains can be cooked and enjoyed as a side dish, in salads, casseroles or as porridge. Being so versatile in the kitchen whole grains have been traditionally enjoyed by cultures around the world. In addition, for thousands of years whole grains have been ground into flours (milled) to make breads and other nutritious grain foods. Today whole grain foods are made from milled whole grains as well as intact, cracked, flaked or puffed grains include whole grain or wholemeal breads, multigrain breads, whole grain breakfast cereals, whole grain crispbreads, wholemeal pasta and wholemeal couscous. Not all whole grain foods are the same. Whole grain foods like bread and breakfast cereal contain between 1.5 grams and 70 grams of whole grain per serve. Looking for bread higher in whole grain? Or need to get kids a breakfast cereal with more whole grain? Look for the percentage whole grain in the ingredient list – the higher number the better. Remember that wholemeal or whole wheat means whole grain. Look out for words such as ‘whole’, ‘whole meal’, ‘mixed grain’, ‘cracked’, ‘flaked’, ‘kibbled’ or ‘puffed’ next to the name of the grain in the ingredient list. Download a list of products registered to carry whole grain ingredient content claims for your clients click here. Words in Ingredient List Is this Whole Grain? For more information on choosing whole grain foods and the recommended amount of whole grain check our page The Whole Grain Daily Target Intake.